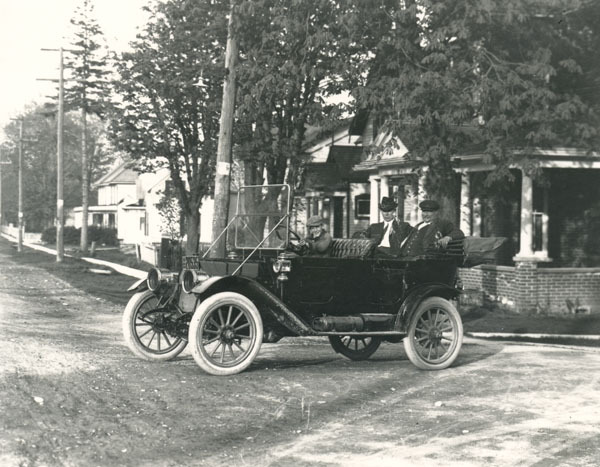 William J. Jamieson, the Chief Constable of Colborne between the 1910s and 1930s, was one of the most prominent people in the village. His long wispy moustache, dimpled smile, and large stature marked his presence in Colborne. Jamieson also seems to have favoured a flap cap (or newsboy cap), as seen in several photographs, a hat style associated with the working class men. Visually, he cut a figure. As a Chief Constable, he was by the book. Chief Jamieson dealt primarily with theft. There were two main varieties – petty theft and car crime. Petty theft varied from stealing eggs, fire wood, canned goods, clothing and bedding from clothes lines, and skipping out on paying board (or ‘beating board bills’ as the newspapers described it). A burglary and theft in 1927 at two local Colborne businesses, the Brunswick Hotel and Mrs. Martin’s meat shop, involved gunfire. Crimes related to cars, a fairly new invention, created another avenue of misfortune, including stealing tires, stealing cars and joy riding. Chief Jamieson had many responsibilities beyond his daily policing duties, including issuing deer licenses and jury summons. Starting in 1921 he acted as a special constable for the Grand Trunk Railway (GTR). 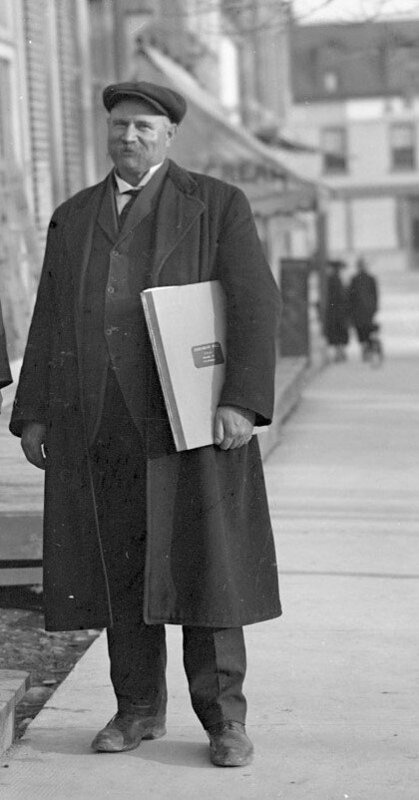 Jamieson also acted at times as a tax assessor. In addition he attended to social issues such as following up on the causes for school truancies and determining the needs of the poor. Jamieson also oversaw road maintenance which entailed spraying the dust down on the gravel roads, assessing the needs and condition of roads and sidewalks, and informing landowners to cut their weeds down on property bordering the highway. 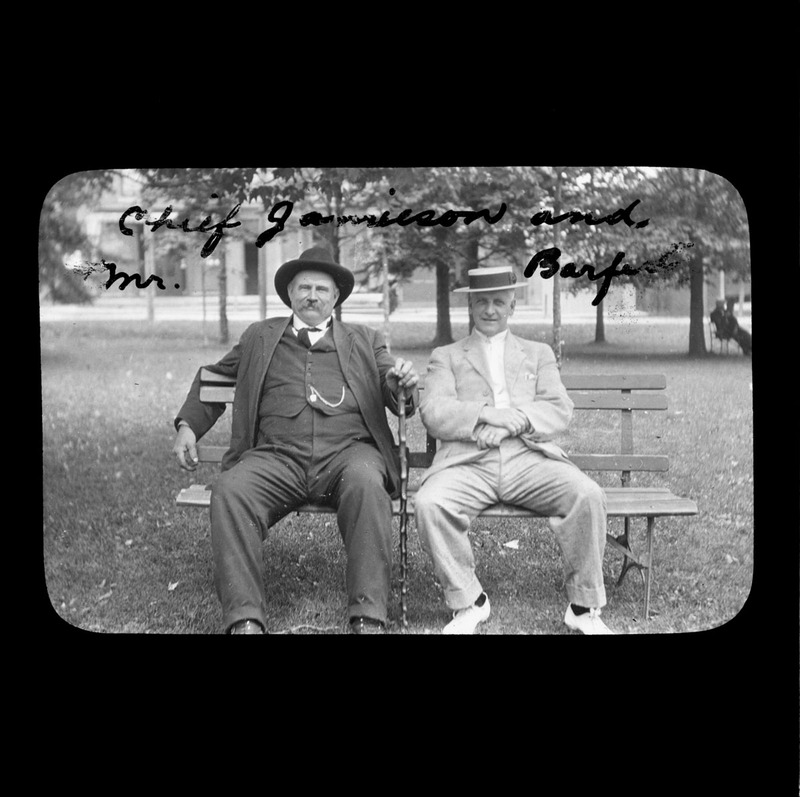 Chief Jamieson kept busy in retirement as well, which was prior to 1937. He spent 9 hours one day in 1938 counting vehicles on Highway 2, which he tallied at 4,100 cars, buses and trucks. Chief Jamieson, Dr. Alyea and Harry Keyes, editor of the Colborne Express, oversaw the raising of the statue of the Canadian soldier in Victoria Square as a memorial to the soldiers of World War I. His work and his presence was vital to Colborne. Whenever he was away from his job due to rheumatism or other illness, Jamieson received many cards, gifts and well wishes from the community. When The Colborne Express ran a brief story about Chief Jamieson becoming special constable at the GTR, many people in Colborne became upset believing that he was leaving his post as Chief Constable. The newspaper quickly put their fears to rest informing them that GTR work was an addition to his duties. He was undoubtedly missed by the community when he attended the annual conferences of Chief Constables Association of Canada, on occasion as far away as Vancouver. The Personal column in The Colborne Express noted that he and his wife often received many visitors to their home, a number of which were fellow police officers from neighbouring jurisdictions. Jamieson was a passionate poultry, geese and duck breeder, showing and winning almost all categories for his many different heritage birds at the Belleville and Picton fairs. Chief Jamieson was married to Miss Jane Browne, formerly of Picton, who was born in Ireland in 1864. Jamieson was also born in 1864. The couple had three children – Mrs. S.D. Scripture, Belleville; Mrs. Allan Coyle, Toronto; and Mr. William Harold Jamieson of Vancouver and had at least two grandchildren. At the time of his wife’s sudden death in December 1938, Mr. Jamieson himself was in bad health. All of the pallbearers at Mrs. Jamieson's funeral in Colborne were police officers. Her obituary appeared in the Colborne Express on 15 December 1938, but Chief Jamieson's obituary has not been located. The burial records for Glenwood Cemetery in Picton notes that Chief Jamieson died in 1942 and was laid to rest beside his wife. Jamieson’s tenure as Chief Constable started from at least the 1910s and possibly went into the early 1940s. Although the information collected from The Colborne Express in the archives of Cramahe Township Public Library provided significant detail about Chief Jamieson, the weekly editions are incomplete and most of this information came from newspapers in the 1920s. A 1905-1907 Colborne and Cramahe Memorandum Municipal Notebook in the Archives details much information about road maintenance and might have been the work of Chief Jamieson. A 1914 advertisement about the sale of poultry by Chief Jamieson was found in the notebook.